I had the opportunity to follow-up with Laura, an Edmonton Hairstyling student, just before she started the second phase of her training. I was first introduced to Laura during our Vegas trip where she made everyone laugh with her very witty answers to a questionnaire put together by Jeff Louis of Artego Canada. It’s been about a month since our Vegas trip. Just before the trip you completed the first phase of your training in the classroom. What have you been up to since then? I have been planning my submission for the NAHAs (North American Hairstyling Awards). I have completed my storyboard for the Avant-garde category. What inspired you to enter the NAHAs? I had the opportunity to work backstage with talented artists Laddie James and Yolly ten Koppel. I was inspired from what I saw but by putting my own spin on it. 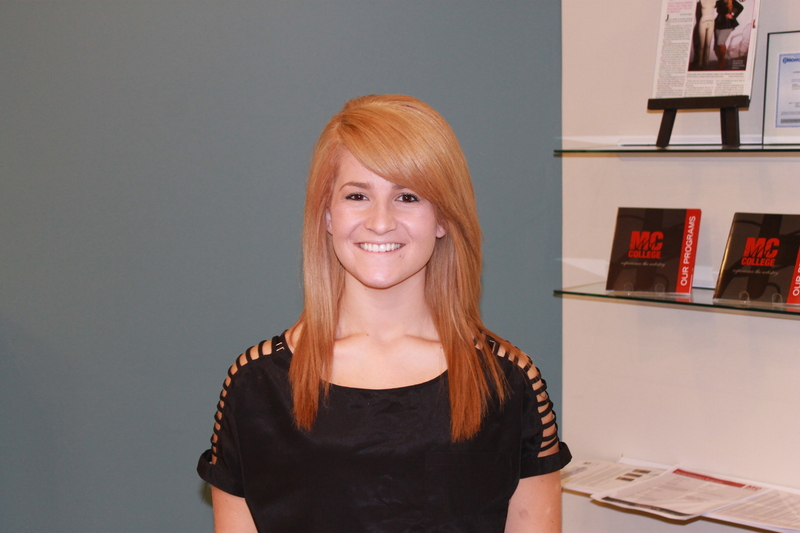 Every year, MC College takes their June Hairstyling students to Las Vegas to attend the NAHAs! During this amazing trip, we put on a two day conference that features a platform hair artist show, fun activities and amazing industry guest speakers. This year, we had NAHA multi-winner Charlie Price as our surprise speaker! How has it been in the school salon? I have been in the salon for about a month. I love it! I’ve already had return clients. In the salon, I am constantly learning. I like to get in there by watching or assisting other students. It makes the day go by faster. I find myself gravitating towards new students and offering advice when needed as I have been there myself. Also, I like to see others put their own flair on cuts and make it their own. I am really looking forward to the NAHA competition next year! As I am competing, I happened to learn aspects earlier such as up-dos and working with hair pieces and fillers. For my concept, I have learned that it’s best to start with simple basic steps and then add to make it more dramatic. It’s the little things that I wouldn’t have known if I wasn’t in the competition. Also, it helps on the salon floor with color and styling techniques. I hype up new techniques with my clients. I tell them that they will look different as they want to be unique. If you’re excited, the client is excited. What advice have you been given towards your goal? I want to be a platform artist. Laddie gave me some raw advice which is what I needed. He told me what to expect and what not expect and what steps to take to get there. I know that I will have to start in a higher end salon in a major market such as Vancouver. He said that I will probably have to volunteer for 2-3 years and it won’t be easy. I have to be willing to give it all up just to do a hair show. What advice would give to the Hairstyling students starting in September? Remember why you are here. I would add to get involved in whatever events and competitions are at school. It gives you a boost and shows you what you could be doing! Thanks Laura. We look forward to seeing you move towards your goals! To learn more about our exciting Hairstyling program, check our website!